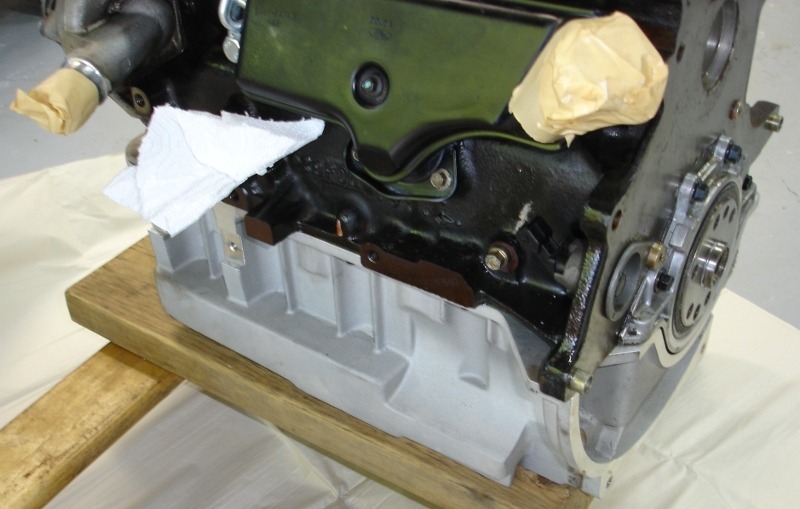 The oil pan is a standard Raceline Zetec-R Wet Sump. While a small bit is machined away to fit the starter (an area of no consequence, really) it is otherwise standard Raceline. It is not only a beautiful casting with lovely machining, it has a lovely cast-in (one piece is bolted in) oil control system and a cast-in oil pickup. With a couple o-rings and another tiny piece joined with a stock Ford rubber serpentine round the edge one simply bolts it up to the block (and torques the bolts: the casting is part of the bottom end stiffening system of the Zetec). You cannot really install the sump with the engine upside down, but it is simple to install properly with the engine on a chain and a couple of dummy screws in the bottom of the block (with no heads) to keep things aligned as one lowers the engine onto the sump. Other important differences (as compared to a TwinCam sump) are that the sump holds a full 5 liters by itself and there is no 'pass through' for the exhaust under the engine. The following shows the sump along with the Fidanze flywheel. The front blue bolt seals in a removable screen in the pump inlet line that keeps large pieces from getting into the oil pump. The side blue bolt is the oil drain plug. 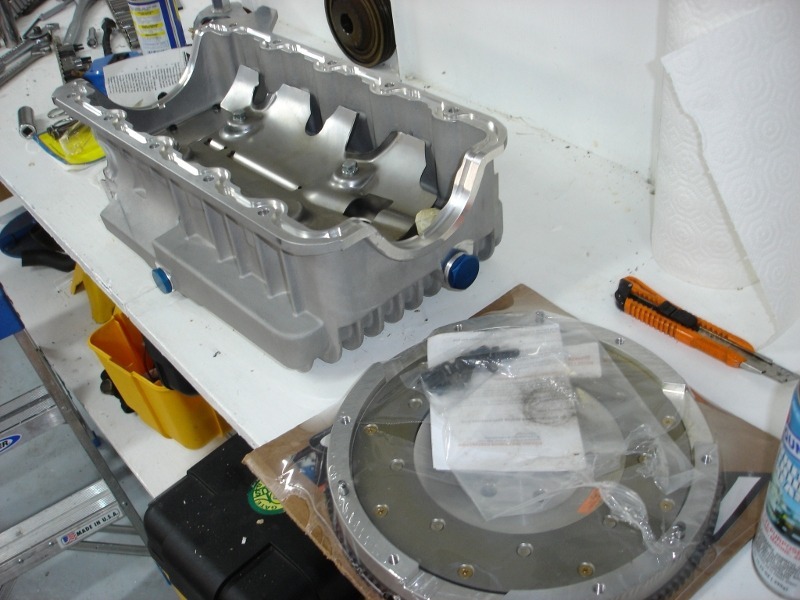 The following shows the sump mounted on the block. This was a very early picture, a tentative mounting. Later the coolant water inlet got moved. The sump is described in detail on the Raceline site see http://www.raceline.co.uk and look for the Zetec-R Wet Sump Kit.